This was not a bad book and there are aspects of this biography that provide a valuable insight into Forster's life and work. However, this biography really follows Forster's life from one angle only, depending on what you expect from a biography, mileage on this may vary. "Of course all those books have got to be re-written," he said. "Unless you start with the fact that he was homosexual, nothing's any good." That is, Moffat is quoting from an Isherwood biography by John Lehmann here, and whether this is a true account or was written as a dramatic embellishment, I could not say. It does, however, go straight to the heart of Moffat's biography ... and also to one of the criticisms I have. Moffat does an excellent job presenting Forster in the context of his sexuality, or more precisely his initial struggles with it and the immense pressure he felt of not being able to live openly for fear of persecution and, indeed, prosecution. Being a young man at the start of the 20th century, Forster would have only been too aware of the trials of Oscar Wilde and would himself witness the arrest of friends and acquaintances over the decades. 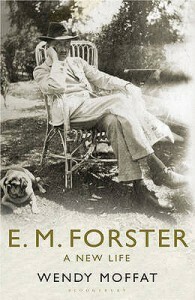 Moffat explores Forster's diaries - including his "locked" diaries, which he also only allowed access after his death - in detail and we do get a clear picture of the anxieties and of the passions Forster had, and Moffat does well to connect Forster's diary entries with the lives of his friends, peers, and with perception of homosexuality in society through the decades. However, this is also the main point where this book fell down for me. Moffat goes into a lot of detail. Salacious detail. Lots and lots of it. At times, I felt like whole chapters were focusing about who bedded whom more so than Forster's life and work. Rather than developing an argument, it felt like some of the descriptions merely served to provide a sensationalist hook. I really should have liked this more than I did, but the meandering descriptions of relationships (not just Forster's but also of his friends and acquaintances) made me skim over quite a few paragraphs. There was little point to most of them. The other criticism I have is with Moffat's writing style. It did not work for me. Her narrative sounded dramatised in a way that made the book read more like fiction than non-fiction and some of the descriptions, as a result of the narrations, did not sound factual even tho they may have been. This was not helped by the way that references were not clearly marked in the text. They were there, of course, but I should not have to check the reference section in the book to see if a certain line on a page is actually backed up with a source of research. All in all, this was interesting, but I would not recommend the book without some hesitation.